First impression is the last impression, so goes the saying and this is the reason everyone wants to be the best version of themselves in their first meeting. This also holds true for places and no one can understand it better than commercial and business establishments where image matters a great deal. Impressions impact the brand image of businesses in major ways and hence, the reception of any office must be done in the best manner. After all, it is the first vision that visitors encounter when they come to the office. The first impression that the visitors gather from the reception should be positive and powerful and if you invest in quality office reception furniture then you would not find it difficult to create a lasting impression in the minds and hearts of visitors. Office reception furniture that is selected in a thoughtful manner leads to cheerful results for it gives out positive vibes to the visitors. It sends out the right message and symbolizes the spirit of the company in the most aesthetical manner. However, this is not the only reason why you should focus on the reception décor. The right type of reception furniture ensures that visitors are welcomed in the right manner, with warmth and comfort as long as they stay in the reception area. A well-designed reception area is essential to ensure a comfortable time to the visitors. It must have a cozy and charming seating arrangement so that visitors can wait comfortably. The reception desk should also be adequately sized and compartmentalized to carry the important stationery and documents. At Urban Hyve, we value and appreciate the right of the reception area to don a decent look. We also understand the significance of comfort in this area and thus, present before you the most updated and unique design furniture collection that would take care of style as well as functionality. Our handpicked reception area furnishing items impart the right look to your reception in keeping with your theme and make it a place to behold. The reception areas are made up of a number of furniture items. The most important office furniture of the reception area is the reception desks. It is the highlight of the reception and the seat of action which plays the constant host to everyone while also being the witness to all the activities that take place over here. It is the place where the receptionist takes the calls, visitors make enquiries and incoming messages are delivered. So, it is bustling with activity all day long and to manage all the different activities, the desk should be well-proportioned. At Urban Hyve, you get to pick from a huge range of high quality office desks to grace the reception. You can select shades as varied as somber brown, warm white, bold black and many more. When it comes to shape, you can select J-shaped, L-shaped, C-shaped, wave-shaped, split counter and other designs of desks to go with your reception area measurements. The size range of office desks at the reception also matters a great deal and it should be adequate in length and breadth. 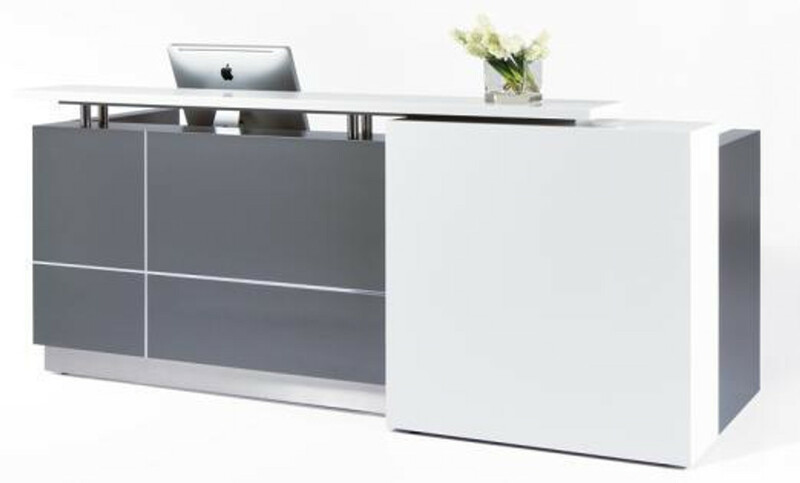 But with Urban Hyve, it is not an issue as you can find any size reception desk. There is single seater curved reception desk, small reception counter desk, corner reception counter desk, modular reception counter with glass top and lot more. The reception office chairs are the second most important furnishing item after the desks as they are primarily responsible for providing comfort to the visitors. So, they have to be high on coziness but that does not mean style can take a backseat. Both are important and Urban Hyve lets you strike the ideal balance between the two with its latest range of smart and stylish chairs. Available in multiple shades like red, brown, black, blue, white, green and more, these chairs are a treat to the eyes and a treasure for funky décor ideas. The design and shapes of chairs is also as myriad as the shades. You can pick tub chairs, curved back chairs, straight back chairs, revolving chairs, round chairs, and more. Lounges and sofas are also a popular choice and available in equally diverse variety. The third component of reception furniture is storage cabinet. The cabinets and credenzas are kept in the reception area to store important stuff and keep décor items as well. They are no less important than the chairs and desks. So, we offer a vivid variety of storage options ranging from large stationery cupboard to bookcase to under desk drawer to keep the important items safely. The reception area is the entrance point of the office. It is the first thing visitors notice after landing inside the office. So, it is necessary that it exudes contemporary charm and what better way to ensure the same other than installing contemporary chairs and desks. These trendy chairs create a unique look in the reception area, establishing the brand in a designer way. In fact, they bring the best of both worlds- style and comfort in one place and thus, are the top-rated choice for the front area. Classy counters and desks provide the perfect backing to these chairs. So, do the cabinets that complement the chairs and desks. The good news is that modern office furniture lets you create the look you have in mind without breaking bank. If you want to set up your reception area in an inimitable style or looking to elevate your reception area to a new high, you must check out Urban Hyve reception furniture collection. We have an exquisite range of reception furniture covering all the components that come under the segment. Chairs, tables, cabinets, credenza, desks; everything is available at unbeatable prices and delivery is free of shipping cost. So, if you are looking for first-rate furniture at fabulous price for your front then just get in touch. Browse, drop your order and get ready to see your reception area rocking in style.